Taken from sign on site – After 1000 years of oblivion, the Trelleborg fortress (or at least a quarter of it) testifies to the city of Trelleborg’s ancient and exciting Danish history. It looms up exactly as it was unearthed, and now, as then, it is built of timbers and earthworks. The six trelleborgs that have been found sited beside important transportation routes either by land or sea. They all share the circular design, monumental dimensions, palisade cladding, moats and imposing gates opening to the four points of the compass. The discovery of this fortress also explained how Trelleborg got its name. It became a city in the 13th century, but by that time the fortress had been long buried and forgotten though it had given its name to the location for all time. 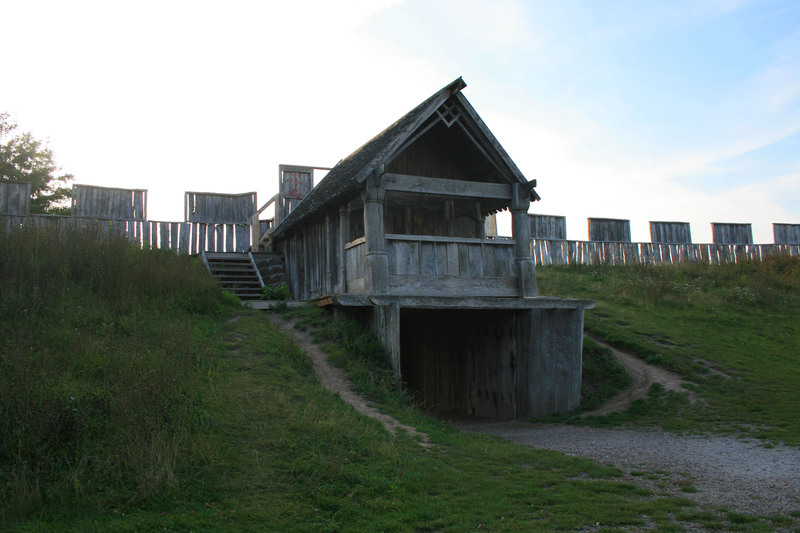 The Danish fortresses have been dated to the period around 980 AD, near the end of the reign of Harald Bluetooth. That was a time of domestic consolidation rather than grandiose Viking raids and expeditions. Denmark finally became one kingdom and Christianity was introduced. Yet the royal fiat had to be manifested and it needed places where it could gather collected taxes and tariffs. Furthermore, it was a time of hostilities with both Germany and neighbours to the north. There was obvious justification for building fortresses. Nonetheless, as early as about the year 1000, the saga of the fortresses came to an end. Harald Bluetooth’s son, Sven Tveskägg (Sven the Uncertain or Sven Two Beards) succeeded his father in the mid-980’s and had new ideas about how Denmark should really be run. The fortresses became obsolete. The archeology found traces of the palisades running in 3 parallel lines. With a circular design they stretched about 143 meters in diameter. Inside, the traces of a strong 13 meter wide earthwork has been found. The gateway were clearly demarcated. Judging by their size, the north-south direction was most important. Even today, Bryggare Street cuts straight through the center of the old fortress. This thoroughfare actually predates the fortress itself. In all probability, the fortress was sited here in order to provide an effective checkpoint for all transports. This is also the highest level of land in the immediate area which implied optimal opportunities to oversee traffic both on land and sea.